Your experience begins with a red carpet welcome from the expert crew as you board your luxury yacht. The 64ft Bluewater Yacht offers all the comforts and amenities of a modern luxury super yacht including air-conditioned cabins and a spacious flybridge with abundant sun and shade seating. Perfect for families, couples, or groups of friends, the spacious, three-level yacht provides plenty of room to relax, meet new people, or simply sit back and take in the sensational views. Set off from Dubai Marina - an artificial canal city of spectacular towers, luxurious hotels and super yachts - and take in views of the giant Ain Dubai Wheel and magnificent royal palaces. The route takes you around the Palm Jumeirah offering picture postcard views of the famous Atlantis hotel and the Palm itself and then on to the magnificent Burj al Arab and Jumeirah Beach. 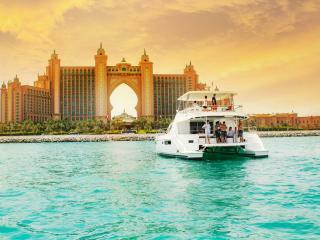 The towering Dubai skyscrapers offer a stunning backdrop throughout this relaxing cruise and the attentive staff will ensure you have a first class experience. A sumptuous barbecue cooked on board and fresh juices is also included.